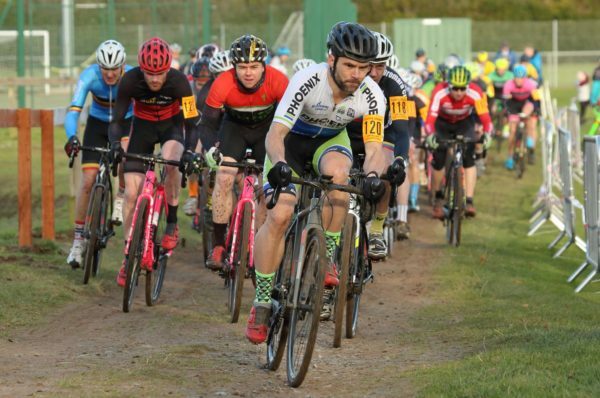 Beth McCluskey and David Montgomery took very strong wins at the Ulster Cyclocross Series yesterday. In the women’s race and men’s A race they blasted away from the start into early leads. And for both it was a question of continuing to power down the course all the way. 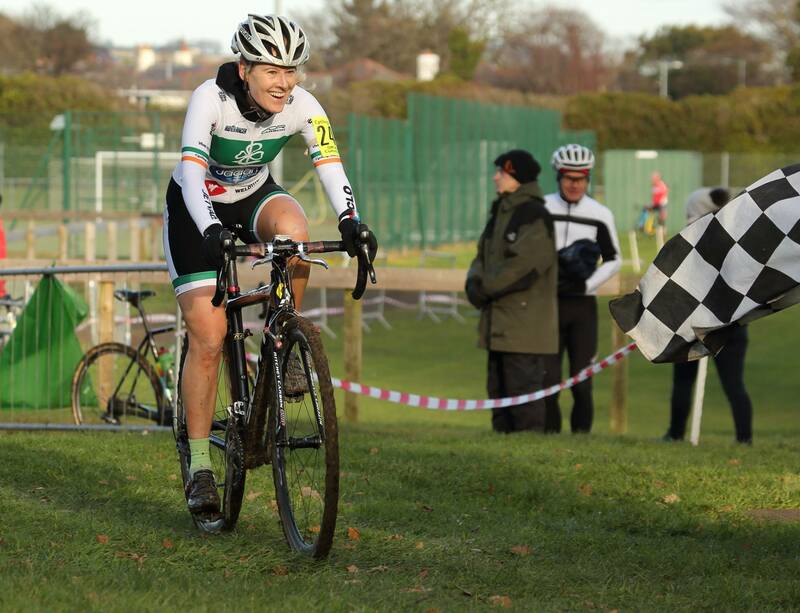 McCluskey (Team Jadan) was the only rider in the women’s field to go around the opening lap in under 10 minutes. She ducked under that marker by a single second. As a result she was immediately 25 seconds ahead of the best of the rest. Behind her, Trudy Brown (VC Glendale) soon settled into 2nd place behind the flying leader. And behind Brown there was a great battle between Julie Rea (Phoenix CC) and Rachel Irvine (Bike House CC) over the opening laps. It was Brown who would complete the podium; proving too strong in the second half of the four-lap race. The men’s race starts; eventual winner David Montgomery is on the rider in the right of those with pink bikes. But up ahead McCluskey simply had too much for the others in the field from start to finish. And she would extend her lead by between 20 and 30 seconds on Brown on every loop of the course. In the end, McCluskey had exactly 1:30 in hand on runner-up Brown. Rea was another 28 seconds back, with Irvine just five seconds further back in 4th. In the men’s race, Montgomery would win out from Graham Boyd (McConvey Cycles) and Barry Kellett (Dromara CC). Montgomery took 20 seconds out of the other challengers on the opening lap. And he continued in that vein. Over the second eight-minute lap he extended his lead on Boyd by another 17 seconds. And while the gains were smaller for the remainder of the race the gap continued to grow. At the finish Montgomery took the win by 1:29 from Boyd, with Kellett another 47 seconds back in 3rd place. And after the nine rounds in the series; Montgomery claimed victory from Boyd and Kellett. In the women’s series, Brown won from junior rider Niamh McKiverigan (Powerhouse Sport) and Rea.